Kick off your visit on the 20th (Mon): make a trip to John F. Kennedy Grave Site, then contemplate the long history of Arlington National Cemetery, and then take a stroll through Old Town. To find where to stay, photos, reviews, and other tourist information, use the Arlington online trip itinerary maker . Buffalo to Arlington is an approximately 3.5-hour flight. You can also do a combination of flight, bus, and subway; or drive. Prepare for somewhat warmer weather when traveling from Buffalo in May: high temperatures in Arlington hover around 76°F and lows are around 58°F. Wrap up your sightseeing on the 20th (Mon) early enough to drive to Chincoteague Island. On the 21st (Tue), explore the striking landscape of Chincoteague National Wildlife Refuge. Keep things going the next day: see what you can catch with a fishing tour and then get a dose of the wild on a nature and wildlife tour. For maps, other places to visit, where to stay, and other tourist information, read Chincoteague Island route builder tool . Traveling by car from Arlington to Chincoteague Island takes 4 hours. Alternatively, you can do a combination of flight and bus; or do a combination of bus and taxi. In May, daily temperatures in Chincoteague Island can reach 72°F, while at night they dip to 57°F. Wrap up your sightseeing on the 22nd (Wed) early enough to drive to Virginia Beach. Visiting Virginia Beach and Sandbridge Beach will get you outdoors. Attractions like Grommet Island Park and Croatan Beach make great kid-friendly stops. There's still lots to do: take a leisurely stroll along Virginia Beach Boardwalk, see what you can catch with a fishing tour, sample the fine beverages at Tarnished Truth Distilling Company, and see the interesting displays at Virginia Beach Surf & Rescue Museum. 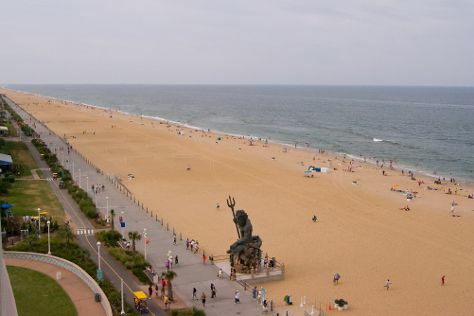 To see where to stay, ratings, more things to do, and other tourist information, read our Virginia Beach trip itinerary planning site . You can drive from Chincoteague Island to Virginia Beach in 2.5 hours. Alternatively, you can take a bus; or take a bus. Expect a daytime high around 77°F in May, and nighttime lows around 60°F. Finish your sightseeing early on the 25th (Sat) so you can drive to Williamsburg. Kids will appreciate attractions like Busch Gardens Williamsburg and Jamestown Settlement. Next up on the itinerary: steep yourself in history at Colonial Williamsburg, do a tasting at Silver Hand Meadery, indulge your thirst for a good beer at Alewerks Brewing Company, and take an in-depth tour of Historic Jamestowne. For photos, where to stay, maps, and more tourist information, refer to the Williamsburg trip planner . Getting from Virginia Beach to Williamsburg by car takes about 1.5 hours. Other options: take a bus; or take a bus. May in Williamsburg sees daily highs of 79°F and lows of 59°F at night. Finish your sightseeing early on the 28th (Tue) to allow enough time to drive to Charlottesville. On the 29th (Wed), learn about winemaking at King Family Vineyards, then learn about winemaking at Albemarle CiderWorks, and then admire the natural beauty at Thomas Jefferson's Monticello. To see other places to visit, more things to do, traveler tips, and more tourist information, refer to the Charlottesville travel itinerary planner . You can drive from Williamsburg to Charlottesville in 2.5 hours. Alternatively, you can take a bus. In May in Charlottesville, expect temperatures between 76°F during the day and 55°F at night. Finish your sightseeing early on the 29th (Wed) so you can drive to Luray. 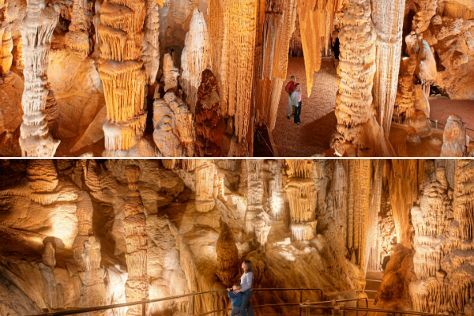 Start off your visit on the 30th (Thu): sample the fine beverages at River Hill Wine & Spirits, take a memorable drive along Skyline Drive, and then explore the stunning scenery at Luray Caverns. Get ready for a full day of sightseeing on the 31st (Fri): trek along Limberlost Trail, trek along Stony Man Mountain Hike, then sample the tasty concoctions at Pen Druid Brewing, and finally brush up on your knowledge of spirits at Copper Fox Distillery. For where to stay, reviews, and other tourist information, you can read our Luray trip site . You can drive from Charlottesville to Luray in 1.5 hours. Another option is to do a combination of bus and car. May in Luray sees daily highs of 75°F and lows of 52°F at night. Finish your sightseeing early on the 31st (Fri) so you can travel back home.